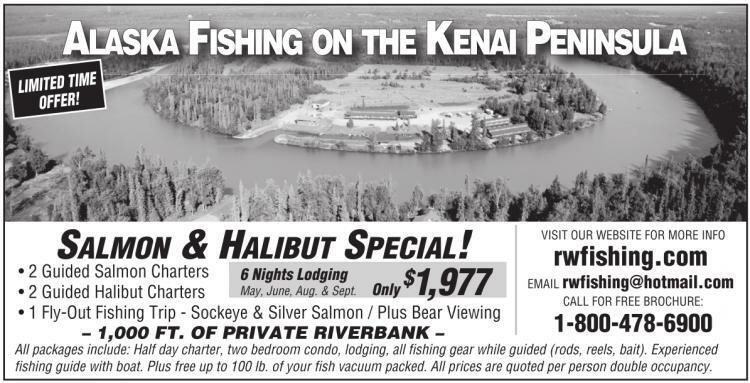 ALASKA FISHING ON THE KENAI PENINSULA SALMON & HALIBUT SPECIAL! • 2 Guided Salmon Charters 6 Nights Lodging • 2 Guided Halibut Charters • 1 Fly-Out Fishing Trip - Sockeye & Silver Salmon / Plus Bear Viewing – 1,000 FT. OF PRIVATE RIVERBANK – May, June, Aug. & Sept. Only $ 1,977 VISIT OUR WEBSITE FOR MORE INFO rwfishing.com EMAIL rwfishing@hotmail.com CALL FOR FREE BROCHURE: 1-800-478-6900 All packages include: Half day charter, two bedroom condo, lodging, all fishing gear while guided (rods, reels, bait). Experienced fishing guide with boat. Plus free up to 100 lb. of your fish vacuum packed. All prices are quoted per person double occupancy. All packages include: Half day charter, two bedroom condo, lodging, all fishing gear while guided (rods, reels, bait). Experienced fishing guide with boat. Plus free up to 100 lb. of your fish vacuum packed. All prices are quoted per person double occupancy.